There are references to a dance with waltz characteristics, sliding or gliding, from the 16th century. The French philosopher Montaigne wrote of a dance he saw in 1580 in Augsburg, where the dancers held each other so closely that their faces touched. 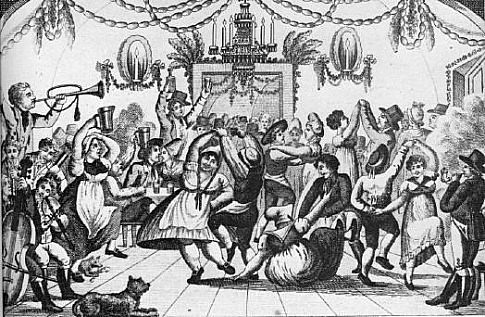 A dance known as the <i>waltzer</i> appeared in Bavaria and Austria, which was danced in couples by peasants around 1750. The <i>Landler </i> also danced in central europe, and was popular in the late 18th century. The <i>Landler</i> was a country dance in 3/4 time and contributed, along with other dances of the period, to the development of the waltz. When the these dances spread from the countryside to the cities, Noblemen bored with the Minuets of the upper classes slipped away to join the balls of their servants where the new dances were popular. The waltz was eventually introduced to the aristocratic portions of society and describing life in Vienna at this time Don Curzio wrote "The people were dancing mad.....The ladies of Vienna are particularly celebrated for their grace and movements of waltzing of which they never tire". Vicente Martín y Soler included a waltz in the opera <i><b>Una Cosa Rara</i></b>, marked <i>Andante con moto</i> or "at a walking pace with motion". Later the waltz was sped up in Vienna leading to the Geschwindwalzer and Galloppwalzer. Fom Vienna, the waltz spread to many other countries o ver the following decades. The Oxford dictionary records the waltz as being "riotous and indecent" as late as 1825, but it became fashionable eventually in Britain during the Regency period. 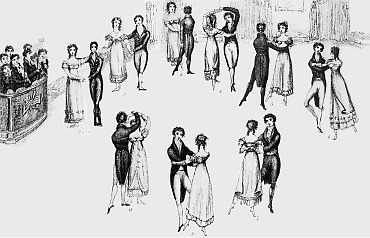 Many new dances have been spawned from the waltz, including some variations of the waltz itself.